If you have a question not addressed below, please visit the Contact Us page to submit your question. Q. How long have you been flying people to medical care? A. Our highly qualified pilots have been flying people to medical care for over 20 years. A. It is free to the patient. A. The volunteer pilots and private donations. 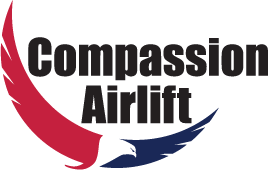 Please consider donating to Compassion Airlift. Your contribution makes a difference. Q. I’m a pilot, how can I help? A. If you are an instrument-rated pilot please use the Contact Us form or email [email protected] to get in touch. Please consider donating to Compassion Airlift. Your contribution makes a difference. Q. Is there a nurse or medic on board? A. No, this is not an air ambulance. The patient must be able to travel without immediate medical care. Q. Can I bring a friend/family member with me? A. We request that you have a friend or family member accompany you during the flight. Q. What if the weather is too bad to fly? A. All of our very experienced pilots are instrument rated so they can fly if it is raining or if there are low clouds. If the weather is too bad to fly safely, we will notify you as soon as that decision is made. Options include traveling another day, but it is always advisable to have a backup plan for other transportation. A. No, you must bring any food supplies. Q. Can I sit up front? A. Sorry, we fly with two pilots. A. Every one of our pilots is involved because of a calling to help less fortunate people who have a financial and medical need for no-cost air transportation. Q. Do I have to stay laying down on the stretcher? A. After take off the stretcher can be adjusted so you can look out the window, however, it must be returned to the horizontal position prior to landing. Q. How high do you fly? A. Low enough so that supplemental oxygen isn’t necessary. Doctor’s information on respiration help us determine an altitude that provides good comfort.